There is something magical about a freshly baked loaf of old fashioned gingerbread. The warm spices fill the room with the scent of the holidays. Cinnamon, ginger, and cloves lure the eager eater to the kitchen to enjoy a slice of homemade gingerbread along with a cool glass of milk. 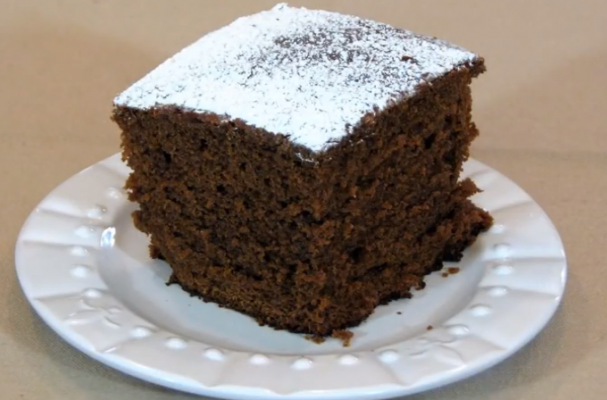 If this familiar scene has your mouth salivating, you can bake your own gingerbread loaf any night of the week. When preparing the gingerbread batter, make sure you are using fresh spices. Gingerbread should be anything but bland so if your loaf is lacking flavor, it might be time to invest in new spices. Pre-ground spices should replaced about every year while whole spices have a longer shelf life. I like to purchase spices from a spice shop as opposed to a grocery store because they tend to be fresher. For this recipe, you can grind your own cinnamon and cloves in a coffee grinder or spice mill. Powdered sugar is the traditional garnish for a gingerbread loaf but if you are feeling extra indulgent, you can whip together an easy cream cheese frosting and garnish with chopped crystallized ginger. This sticky, spicy and sweet treat is a must make holiday treat.